Wombat normally handles the posts about animals that don't act right, but these are so horrible that I just have to post them. I'd recommend not reading this post before/during/after eating, because you might not for another week. If you still want to continue, I bear no responsibility for the consequences. ...ants have a skinny little waist through which their digestive tract must pass. Solid food would lodge in the bottleneck and kill the ant, so the ants can’t eat solids. They can only drink. Yet, in forgoing solid food ants miss out on all sorts of protein available in the environment. Ants must either give up protein or figure out how to convert solids into drinkable juice. That’s where the larvae come in. Larvae are made to eat and can handle all manner of food. 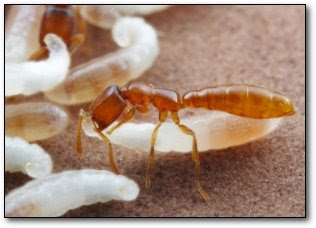 They consume the solids that the worker ants have brought back to the nest and, after a little digestion, pass the protein back as a liquid. Most ant species have a simple, elegant way to do this: they regurgitate for the adults when prompted. But this direct food-passing behavior only appears in the more recent ant lineages. The ancient subfamily Amblyoponinae- including Adetomyrma- diverged from the rest of the ants over 100 million years ago and couldn’t inherit this sensible way of doing things. Natural selection is a blind process. Evolution often solves problems with unexpected, rube-goldberg solutions that any reasonable designer would never implement, and the Amblyoponines happened on one of those odd solutions. They found a more morbid way to get at all those larval proteins. 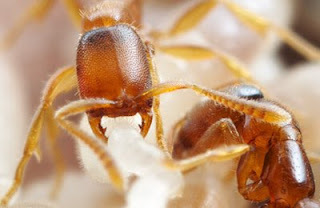 The adult ants just chew a hole in the larval skin. The hemolymph oozes out, and the adults take a drink. 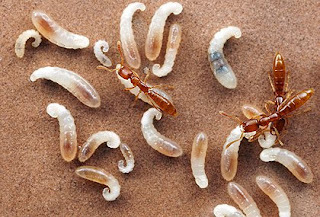 Yes, these ants cut open their own young and drink their blood. Fortunately, the young seem to have no long-term harm (besides scaring from having their abdomen chewed open), and grow up to continue the cycle. I should have heeded your warning. I was eating breakfast when I read this. It reminds me of a description I read in one of Annie Dillard's books, about some critter sucking out the innards of a frog and the skin collapsing in tact... eeuw. Thanks for the morning gross-out. I never knew any of that about ants. Fascinating. Sadly, I know some human parents who do the same thing, metaphorically speaking. I seem to recall that the Mongols did this sort of thing with their horses. I'm sure they all love each other really. So when the adults are hungry, do you think they say: "Let's go eat some grub"? Oh man, animals are disgusting. DO these ants sparkle in the sun and are incredibly good looking? Yep, you're right. They are truly horrible. I don't know if I should be amazed or grossed out! I am just glad I haven't run into these scary little ants! Thank you for sharing! Well, the 'more evolutionary developed'ants drink the vomit from their 'babies', and these just drink straight from the source. Which is more gross? Hmm. And my Scottish ancestors bled their cows to make haggis...again, with no long-term harm to the cows. (The blood was/(is?) as nourishing as the meat, but by using the blood only the animals continued to produce milk. Once dead, the cow is gone for good. Humans are not really MUCH higher on the evolutionary chain in some respects.